One of the great pleasures of early summer in Great Britain is to stroll through a bluebell wood; the carpet of blue and the wonderful scent of the flowers are delights that lift the spirit. It can really help us to dispel the undesirable ‘blues’ of the past winter months. In addition, what fantastic places they are to enjoy a family picnic. Unfortunately, how much longer we will be able to enjoy this late springtime treat is now in doubt? The bluebell like many other plant species is under threat. What is the history of this beautiful plant, and how will it fare in the future? Our native bluebell, botanical name Hyacinthoides non-scripta, is found in most parts of the British Isles. The main exceptions are the Orkney and Shetland Islands. We are used to seeing the plant in a woodland setting but it can also thrive in open country. On the wetter western side of the country it can be found growing in hedgerows, on grass banks and even clinging to cliffs. Over the centuries local names for the bluebell have been passed down through the generations; these vary widely in different parts of the country: bell bottle; blue bonnets; Adder’s flower; and fairy bells, are some that are still in use today. The last of these reflects some of the myths that surround the flower’s relationship with the fairies. Bluebell woods are said to be enchanted areas used by fairies and are dangerous places to linger around the midnight hour, as this is the time that the fairies come out to dance to the music of the ringing bluebells. Be warned! They are said to not take kindly to human presence. There are many superstitions and myths surrounding the bluebell. It is said that if you are unfortunate enough to hear a bluebell ring then you are not long for this world. In some parts of the country it is considered unlucky to bring bluebells into the house. This may not have as much to do with the actual flower as with its colour; the colour blue was extremely significant in times past. The Pharaohs of Egypt wore blue for protection against evil forces; the Virgin Mary is always depicted wearing blue clothing, associating an element of holiness with the colour. Individuals often wore blue beads to ward off common illnesses, a tradition that did not die out in many places until the first quarter of the twentieth century. We are all familiar with the old saying, ‘something old, something new, something borrowed, something blue.’ The tradition of a bride wearing something blue on her wedding day to bring good luck to the marriage is an ancient one that is still taken very seriously. I am sure that even in these enlightened times there are very few brides going to the altar who are not wearing something blue – even if it is hidden. It is a fact that even in modern times we take these things very seriously. It is therefore perhaps understandable that superstition has attached itself to a flower that can be as vibrantly blue as the bluebell. Prior to the nineteenth century the interest in plants was twofold – could it be eaten or did it cure illness? In medieval times extracts from the bluebell plant were used to treat leprosy and were believed to be effective against snakebite. During the nineteenth century flowers began to be appreciated more for their beauty and were given symbolic meaning. Given as gifts or tokens of love, the choice of the correct bloom to convey your message became very important; a whole library of flowers with different meanings was available. The bluebell became a symbol of constancy. Scientists are at present investigating some of the bluebell’s unique qualities; it contains substances that may be useful in developing treatments for serious human illnesses such as cancer. Perhaps one day it will be a common site to see fields of cultivated bluebells being grown for the use of the pharmaceutical industry. But beware! All parts of the plant are poisonous to humans; the sap from the stems can also cause dermatitis. The D of E reports that cases of poisoning have occurred when the bulbs have been mistaken for onions. Is the bluebell under serious threat of decline? A real worry is the effect of global warming. If this continues to increase the plant is going to encounter great problems competing with other species. More vigorous types of plant will be appearing earlier in the growing season and may well stifle the growth of the bluebell. Beds of bluebells can also be physically damaged through trampling; leaves and stems are crushed preventing the plant from storing food for the next season. However tempting it is to wander through the bluebells, resist – stay on the path. Humans are not the only culprits. In many parts of the country the size of wild deer herds is increasing. They will not eat the plant, but unlike us they don’t use footpaths, thereby causing damage as they range through the woodland. The Wildlife and Countryside Act protects the bluebell but this has not deterred unscrupulous people who quickly realised that there is a ready market for the bulbs. Naturalised gardens have become fashionable in recent years and the demand for wild flowers has increased. It is known that gangs of men visit woodland and dig thousands of bulbs that are then sold to the public through third parties. Newspaper reports of prosecutions have not stopped this business as big money can be made. Always ensure when buying bluebells (or snowdrops) for your garden, that you are purchasing cultivated stock and not bulbs illegally removed from the wild. It is not all bad news however, many nature conservation organisations are working hard to improve the lot of the bluebell and their efforts are already being rewarded. I recommend that you prepare a picnic and get out and about during the next bluebell season and visit some woodland in your area. My tip is to go very early in the morning or later in the afternoon; the colour is then at its most striking and the scent is at its strongest. 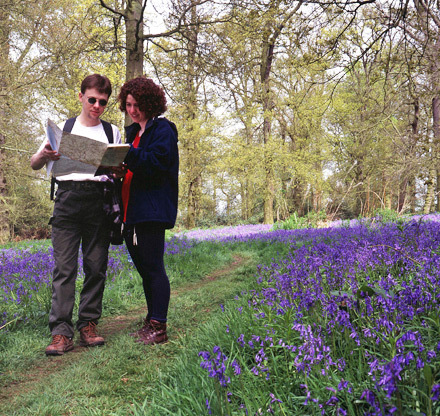 The National Trust’s Blickling Woods near Aylsham have a healthy population of bluebells. Foxley Wood off the A1067 Fakenham to Norwich road is also recommended. If you are not sure where your nearest bluebell woods are located then contact the Norfolk Wildlife Trust who will be pleased to advise you.